Located in Sao Paulo, Brazil, this 70 square meters loft belongs to an young musical and advertisements actor. His modern lifestyle reflects the concept of an integrated loft, whose social and intimate areas are separated only by a curtain, which also refers to a theatrical scene. For the whole structure of the apartment it was chosen a single material, burnt cement, which covers floor, walls and ceiling. 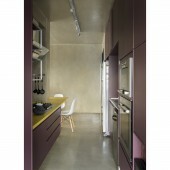 It was added to this neutral structure an unusual mix of shades of burgundy, lilac, purple and yellow. As a request of the client who lives alone, the intimate area was designed to bring comfort. Closet, bathroom and tub were sectored by creating a gap, and also with natural wood for the floor. The integration of this area created an atmosphere of SPA or a real bathing room. Also in this area, it was created a small office with acoustic isolation that allows the owner to work from home. 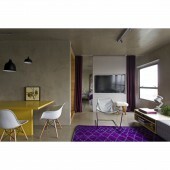 The result is a well used apartment, that brings everything to a practical and actual lifestyle, without losing beauty. An interesting point of the project is the contrast of cement, colors and wood. The set is harmonic, beautiful and extremely actual. The project started in april 2013 in Sao Paulo, and finished in november 2013. For the whole structure of the apartment it was chosen a single material, burnt cement, which covers floor, walls and ceiling. It was added to this neutral structure an unusual mix of shades of burgundy, lilac, purple and yellow. The kitchen with gray structure and burgundy cabinetry received a yellow top, which occupies the eating area and also the food preparation area. 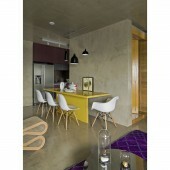 The choice of yellow broke the used shades and made the apartment even more modern and cheerful. In addition, the top on the same height for the stove and for the dining table was a bold architectural solution. The apartment has 70 square meters. The main idea of the project was to keep the concept of loft; an integrated and open space that was consistent with the original proposal of the project of the building and that corresponded to the habits of the new resident. Single, actor, announcer and young man, the idea of ​​living in a small but pleasant space, practical but comfortable married his pace of life and his contemporary vision of the way of living. Contrary to the idea that small spaces ask for small furniture, it was chosen an ultra sized sofa, which takes up two walls of the living room. Unlike what people imagine, this sofa has brought immense breadth and lightness to the room. Diego Revollo began his studies in Civil Engineering in the Polytechnic School of the University of São Paulo in 1994. He joined the Mackenzie Presbyterian University in 1997 and graduated in Architecture and Urbanism in 2001. He began his career in 2000 working with Roberto Migotto and in 2007 opened his own office. Diego values above all the beauty and has, as his main virtues, aesthetic rigor and the search for balance. Attentive to details and perfectionist, he uses classical elements in his contemporary projects. He acts from the initial conception of houses, apartments and commercial spaces to the final choice of objects and works of art. Author of the first project of Armani Casa store in Brazil, Diego Revollo is slowly making his mark in Brazil and Latin America. His works have been published in magazines and books in Italy, Germany, Spain, Canada, Mexico, Russia, Czech Republic, Sweden, Lithuania, Ukraine, Lebanon, Saudi Arabia, UAE, China and Japan as well as worldwide websites. He is currently part of the board of the magazine Casa e Comida, from Editora Globo. Vila Leopoldina Loft Loft by Diego Revollo is a Nominee in Interior Space and Exhibition Design Category. · Click here to register today inorder to be able to view the profile and other works by Diego Revollo when results are announced. Vila Leopoldina Loft Loft by Diego Revollo is Winner in Interior Space and Exhibition Design Category, 2016 - 2017. 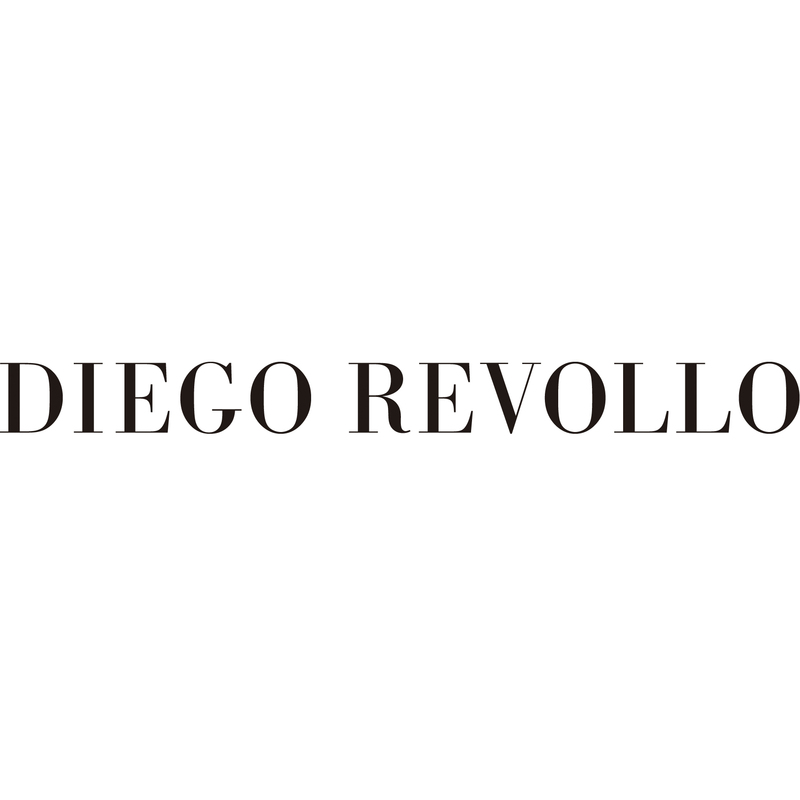 · Press Members: Login or Register to request an exclusive interview with Diego Revollo. · Click here to register inorder to view the profile and other works by Diego Revollo. Did you like Diego Revollo's Interior Design? Did you like Vila Leopoldina Loft Loft? Help us create a global awareness for good interior design worldwide. Show your support for Diego Revollo, the creator of great interior design by gifting them a nomination ticket so that we could promote more of their great interior designs.